Oatmeal with Cinnamon, Maple Syrup, Chia Seeds, Kefir, and White Peaches. Guayusa Tea. Ana arrives home from an afternoon workout at the gym. Said she saw my ex-girlfriend, Margot, there. Meanwhile, I playfully bite her arms. Referring to the treble clef tattoo on her right arm I say, "I'm gonna bite this clef off right here." "Yeah cause it’s so much treble." She blurts out the pun without even thinking about it. I take myself to the gym and burn up some calories on the basketball court. Grilled PB&J. Honey Crisp Apple. Olive Oil Potato Chips. Honey Green Tea. 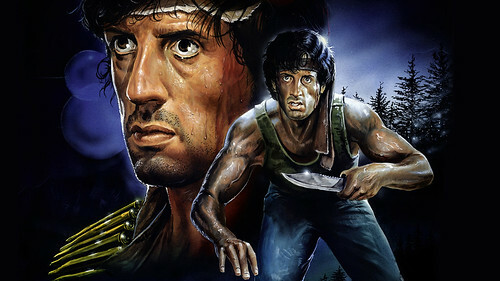 Watching First Blood (1982) – the first in the Rambo series. Salad with Arugula, Spinach, Carrots, Tomatoes, Cucumbers, and Beets. Leftover Pizza and Garlic Bread. Practicing more music. Then, practicing more music with Ana. Her hearing issues sometimes creates problems when we try to harmonize together. [i] Fan art for Rambo.